The W51031Q3 is one of Cartier's Tank Francaise series model. An stunning Swiss watch that is simply a must have for watch-loving women. 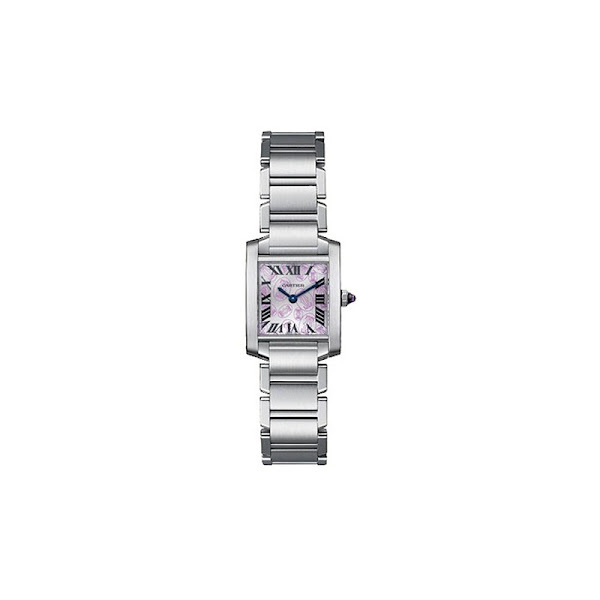 This Swiss made Cartier watch features an elegant scratch-resistant sapphire dial window and a grey dial adorned with a pink double C pattern. Its handsomely crafted 20-millimeter case, bezel, and bracelet are featured in a high quality stainless steel. Furthermore, the W51031Q3 model wristwatch's dial has sword-shaped steel blue hands and Roman-numeral hour markers. While its octagonal crown at the 3 o'clock position is adorned with a pink synthetic spinel cabochon. Powered by Calibre 057 Swiss-quartz with two-hand movement, this 99 feet water resistant Cartier Tank Francaise's original price is $3,450. You can find an original Cartier W51031Q3 Watch at the site(s) listed above. However, we don’t guarantee its availability as being listed here simply means that those site(s) has the item in question by the time we wrote the review. The review in this page is written by garnish at Monday, September 19, 2011. The post is tagged as analog, cartier, watch, women.